Video Contest – Hey U.G.L.Y. Most of us have witnessed someone being bullied but we don’t do anything to help. In fact statistics show that 75% of those involved in bullying situations are bystanders who either urge the bully on or do nothing. So many of us see bullying happen but we don’t step in to help the person or persons being bullied. This is awful because some students are choosing to end their lives because of being bullying and feeling that no one cares. IMPORTANT NOTICE: All entries must adhere to the rules and regulations found at the bottom of this page. Contest judging will be conducted by experienced filmmakers. Winner of our 2016 contest: Nathan Gibson, Daniel Halstead, Ana Ramirex, Atara Zmora, Pranathi Madala and advisor/facilitator, Kim Jarvis at Sycamore Junior High in Cinciannati, OH. Click the picture to watch their film then let us know what you thought of their creativity and message to be an upstander. 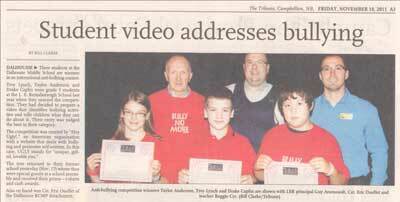 Click picture above to watch DEAR BULLY, the winning video for 2012/2013. DEAR BULLY, intertwines bullying scenes with popular music whose lyrics tell the story of all aspects of bullying. 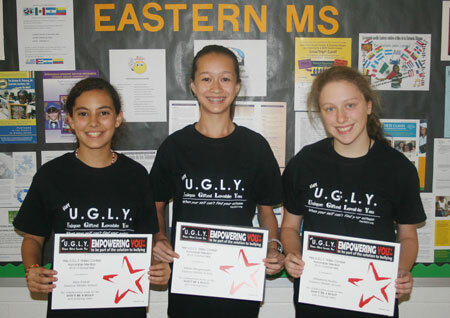 One of the most salient points of the film is when the bully explains to the victim …“the reason why I bully you is because I’m insecure.” Pictured above, left to right, are the students who wrote and acted in the video: Virginia Henrici, Shannon Lamb and Julia Barton-Biegelsen, from Eastern Middle School in Maryland. Click picture above to watch DON’T BE A BULLY BE A SAVIOR, a video that won special mention in 2012/2013. 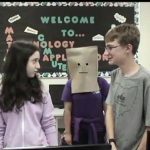 DON’T BE A BULLY BE A SAVIOR is a powerful film that enacts various bullying scenarios and ends with a slide show of famous people who were bullied ranging from Rev. Martin Luther King and Rosa Parks to modern day celebrities and political figures. It helps us all see that we don’t have to give in to the bully; we can actually grow stronger because of their taunts. 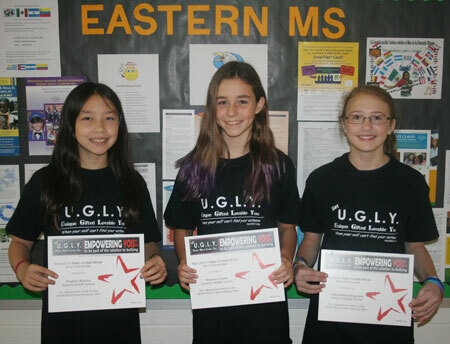 Pictured above, left to right, are the students who created the video: Alya Fawal, Addele Hargenrader and Elizabeth Budin, from Eastern Middle School in Maryland. Both videos were created under the tutelage of Warren V. Scheib III, Media Teacher and Newspaper Advisor at the school. Click here to watch second place winning entry created by students from Strafford School in New Hampshire. Entrant’s name, age, grade, school, home address, email address and phone number must be included. Any submissions without that information will be deemed ineligible. Contestants may enter contest more than once. Must be 7 – 17 years of age to enter. Void where prohibited by law. All entries must be uploaded no later than May 31, 2019. All entries submitted for judging will become the exclusive property of Hey U.G.L.Y., Inc. and will not be returned to entrants. It will be deemed that permission and photo release forms have been attained by the videographer for use of any person/s likeness portrayed in photo. To determine the winner, all entries submitted will be judged on impact of message and originality. An independent panel of filmmakers will conduct judging. Judging will take place on or about July 15, 2019. Decisions of judges are final. Winner will be notified, by phone or email, no later than September 15, 2019. First Prize is $100.00. Will be paid out by paypal or written check. If you wish your winning to be by written check please send self-addressed stamped envelope to P.O. Box 2142, Michigan City, IN 46361. To receive a written letter listing the winning entry make request by email by October 15, 2019. Winner need not be present to win. All taxes and any expenses not indicated herein are the sole responsibility of the winner. Any prize returned as undeliverable will be awarded to an alternate winner. Entry and acceptance of prize constitutes permission (except where prohibited by law) for sponsor and anyone it may authorize to use winners’ names, photographs or other likenesses, biographical information, hometowns and statements concerning the contest for purposes of advertising and promotion without compensation to the winner. Employees of Hey U.G.L.Y., Inc., its affiliated companies, participating partners and their respective advertising, promotion and production agencies and their immediate families are not eligible. Not responsible for lost, late illegible, mutilated, postage-due, misdirected mail, typographical or other errors. All prizes are guaranteed to be awarded.